Paper mache bowls have been around for centuries, with good reason. Paper mache is a craft that is easy enough for a child to master, yet artistic adults can also get amazing, professional results with a little bit of effort. This papercraft tutorial focuses on children and is very easy to make. Circle pattern pdf printables are available for free download. Follow the tutorial instructions and your children will have paper mache bowls they will be proud to give their mom as a gift. Just in time for Mothers day. Print one copy of the sheet that has the blue dot pattern circle onto plain computer paper. Do not use card stock as the layer is too thick and will not hold the shape of the bowl. Print as many pages as you think you will need for the size of your bowl. Place the printed sheets face down in your printer and print the blue square onto the backside of the circle patterned printed sheets. If you have done this correctly, each sheet should have a patterned side and a side with a solid blue background. Cut out all of the circles with scissors. Glue one solid color circle to the back of a patterned circle. You should now have one circle that has solid blue on both sides, and the rest should have one blue side and one patterned side. Turn your glass bowl upside down. Cover the bottom of the bowl with saran wrap. Make sure that the saran wrap is as smooth as possible. Be sure to stretch the plastic wrap over the bowl to eliminate any wrinkles. Apply a layer of mod podge with the foam brush to the back and front sides of the double-sided blue circle. Place the solid blue circle onto the top center of your plastic covered bowl. Press the circle down firmly with your fingers to make sure it is securely attached. Continue to glue the paper circles pattern side down and form a row around the center circle. Add a second row of mod podge circles onto the first row as in the photo above. Cover the bowl with additional rows of glued paper circles. All the entire project to dry at least 24 hours before removing the paper mache bowl from the glass bowl. Gently pry the mod podge bowl from your glass or metal bowl. Carefully pull away any saran wrap that may be sticking to your paper mache bowl. Trim any glue or ragged edges with scissors to produce a smoother edge. How to Paper Mache Learn the fundamental concepts of the craft of paper mache. Several Types of Paper Mache Recipes There are several ways to make paper mache paste. You have to decide which type to use according to the kind of craft project you are making. This article will show you how to get the best results possible. Step by step paper mache recipes This is an excellent article for beginners. 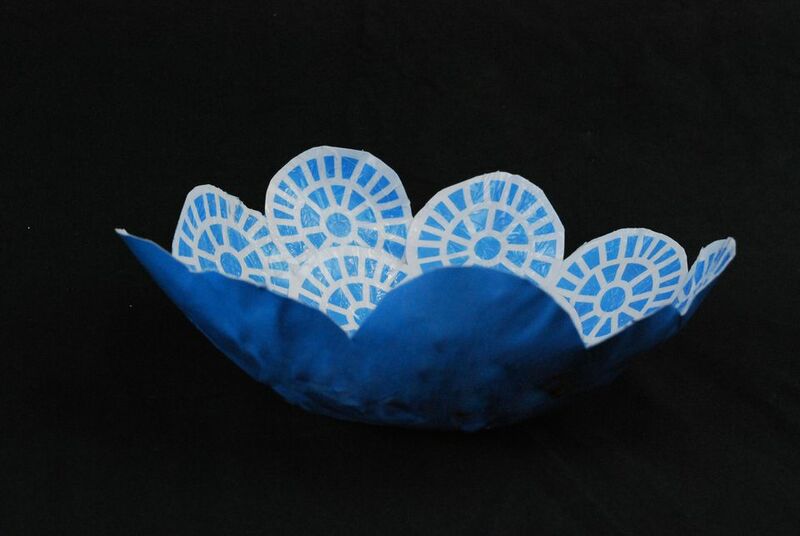 Now that you know how to construct a paper mache bowl try to make one for yourself. You will discover that paper mache bowls are super easy to make. You will also learn that they are fun and an outlet for stress relief.